These bronze metal heat registers are sand cast by Classic Grilles here in America. The Octagon wall air vents are offered in hand rubbed antique, light or dark bronze and will compliment wooden accents. Each metal heat register is made with a 1/4" thick faceplate to provide strength to the product. These wall air vents can be used in the ceiling or in the floor as well since they are made from bronze. 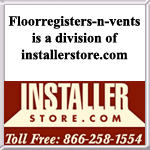 If you are using the metal heat register in the floor, order the vents without the pre drilled screw holes. Ceiling and wall air vents will come with screws for mounting installation. The handmade metal heat registers have a steel damper attached to the back which will open and close off airflow in your home. When ordering the Octagon wall air vents, please make sure to order according to the measurement of your duct hole opening. Tip: The metal heat registers above are listed according to ductwork opening measurements. A 10 x 6 inch opening requires a 10 x 6 wall air vent. The outside dimensions of each register will have an additional 2 inches added for mounting purposes. The overall size can vary between vents since each one is handmade. Important: These metal heat registers are considered special order, non returnable and cannot be canceled once order has been placed. Because the wall air vents are custom made, they can take 7 to 9 weeks to ship. Order other metal heat registers by Classic Grilles by viewing all the designs available. 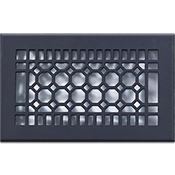 Also available are Octagon wall air vents with a screen backing to allow for constant airflow. Order decorative metal heat registers which can be used throughout your home today!